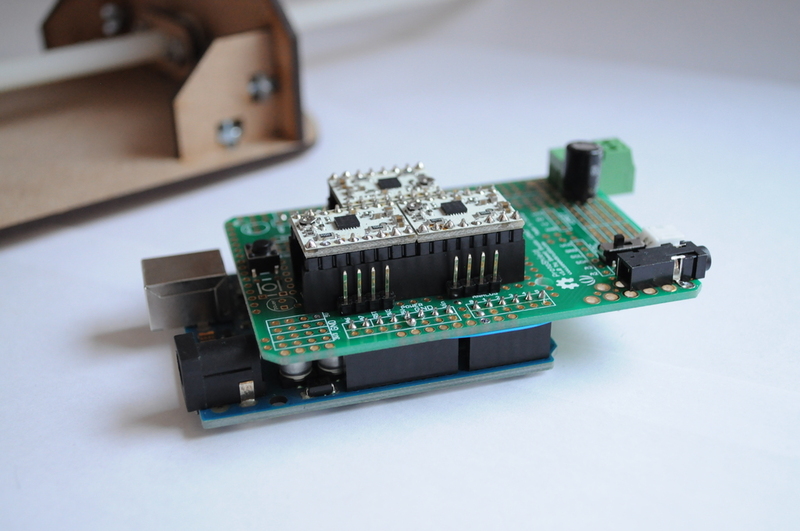 A new update to the Arducorder Mini, detailing the layout of the modular sensor boards, capacitive touch wheel, and radiation sensor interface board. I’m expecting the motherboard and rest of the components to arrive from the fab this week! 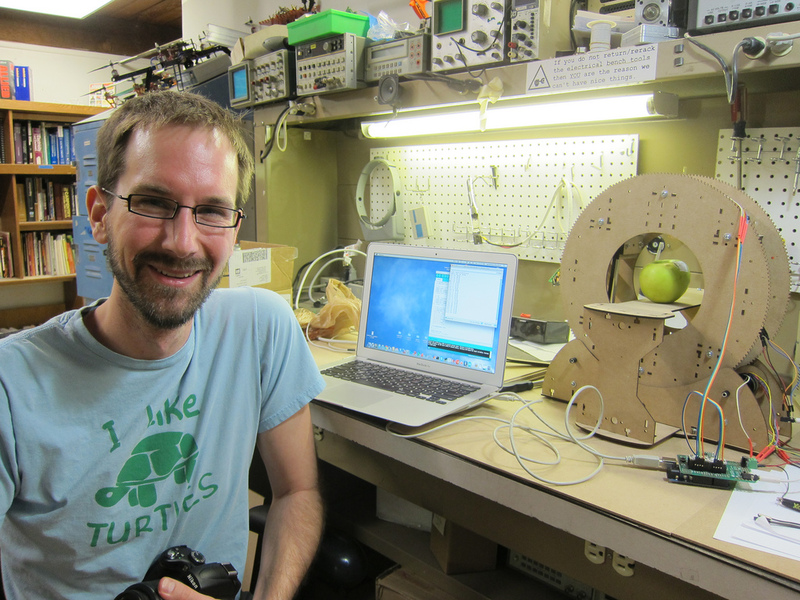 The Hackaday Prize and the Arducorder! I think it’d make a great story to say that the fellow who designed real (open source!) 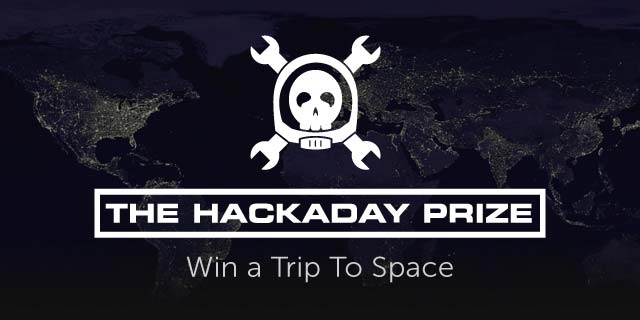 science tricorders made it into space, and so I’ve started the next chapter in the project — entering the hackaday prize to win a trip to space! There’s something about a near-term fixed deadline that helps turn research projects and prototypes into complete and functional devices. 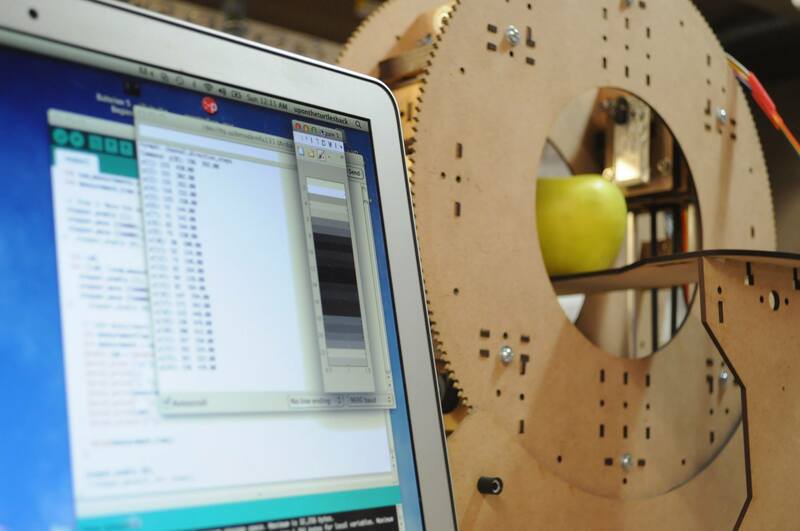 The hackaday prize prototype has to be working in just over a month, and complete in a few months, with regular milestones on the way. This challenges you to be fast, efficient, make your mistakes cheaply, and make interesting but safe design choices to ensure that the design is completed on time. 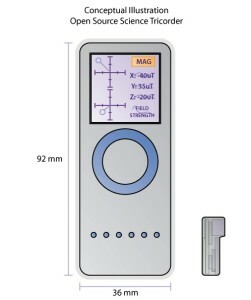 I confess that I’ve been excited about exploring the space of open source science tricorders, and so I’ve incorporated a lot of hot-off-the-press components into the designs that in many cases don’t yet have a lot of support or examples to work from. This makes for interesting and high-risk experiments, but it doesn’t lead to the end-game that I get so many e-mails about — actually having an inexpensive science tricorder-like device in your hands. Hopefully this will help change that. 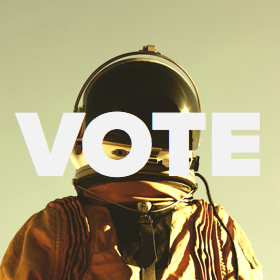 Vote: There are two mechanisms for voting, and both require an account on Hackaday IO, but it only takes a moment to sign up. Once you’ve signed up, please visit the project on Hackaday IO and select “Give the project a ‘skull’ symbol” to show your support. 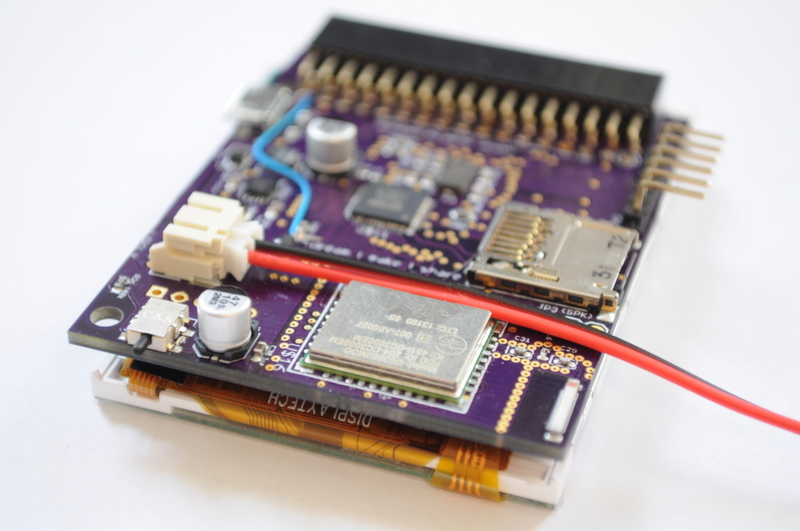 This helps show your support for the project, and show it to more folks who visit Hackaday IO. More Voting: The second set of voting helps determine the interest in each project concept entered into the hackaday prize. It takes a minute or two to complete this step, and as a bonus you get to quickly become familiar with some of the other great projects in the competition! Write a kind note: The kind words of encouragement that folks send are genuinely helpful, and are very appreciated. 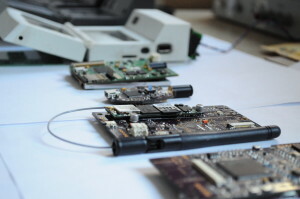 If you like the project and have a moment, please feel free to write a note in the comments (either here or on the Hackaday IO project site). I read them all, and apologize that there sometimes isn’t enough time in the day to reply to them all while still making progress. Thanks for reading! With the first set of boards being made as we speak, it should be an exciting few months! Stay tuned! 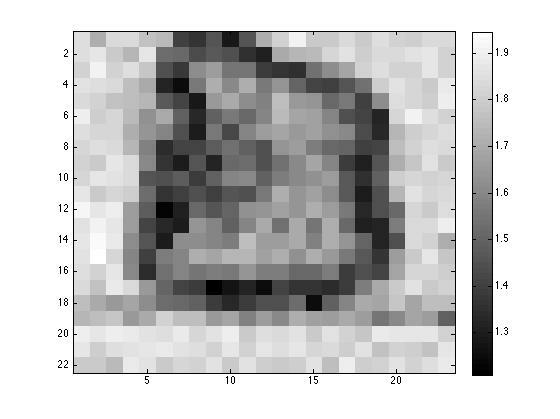 I’m very happy to announce the first release of the Open Source Computed Tomography (CT) scanner project. 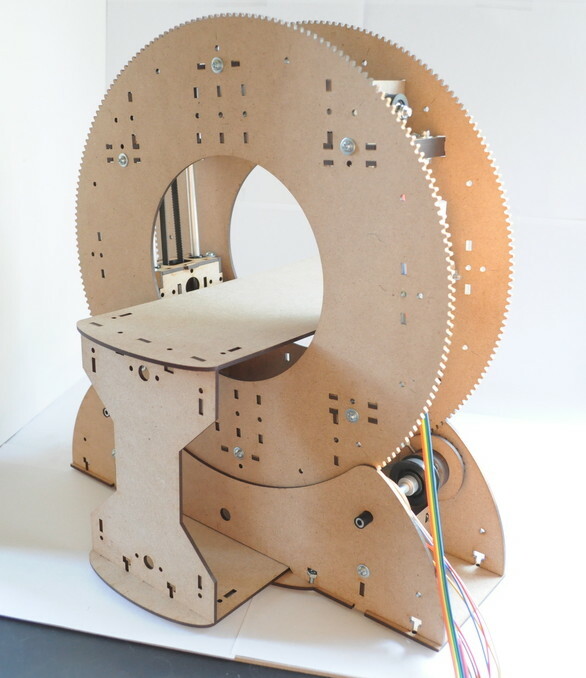 This is an early alpha release, and contains all of the source at the projects current stage, including the laser cutter design files for the machine structure, EAGLE source files, and the sample Arduino sketch. The source is available for download here [zip], and is also available on GitHub. 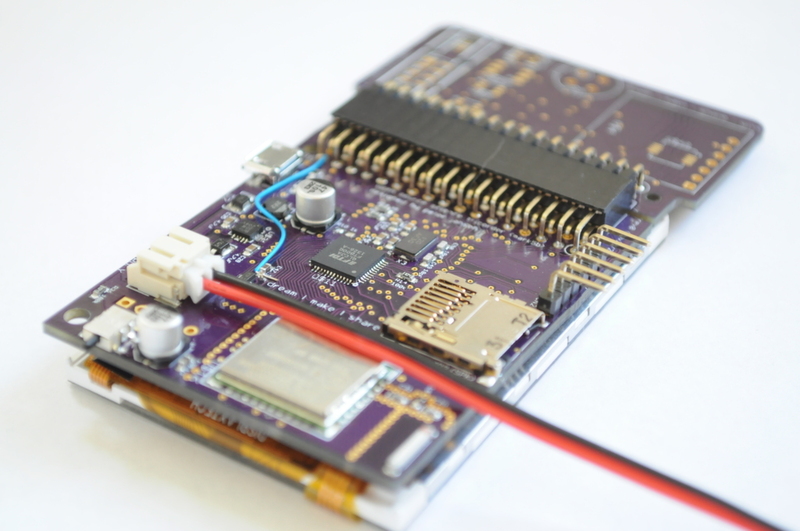 For potential contributors, the TODO file also includes near term project goals at a variety of skill levels, from adding end-stops and designing the official Arduino shield, to designing parallel detectors that decrease scan time, and developing a new source/detector pair for different wavelengths of interest. I’m excited to see what folks do with this project, both now and as it matures. If you build one, want to contribute to the project, or encounter any issues, please send me a note. 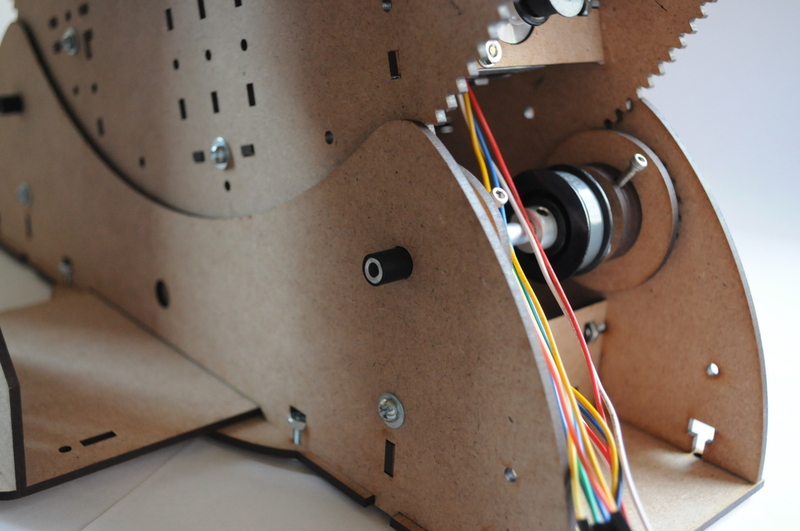 In other news, the Bay Area Maker Faire is coming up in a short two months. With a good amount of progress on the Open Source CT Scanner, I’m going to switch gears for a while back to the Mark 5 Arducorder — I’d love to have the firmware and basic functionality working and demonstrable by then. 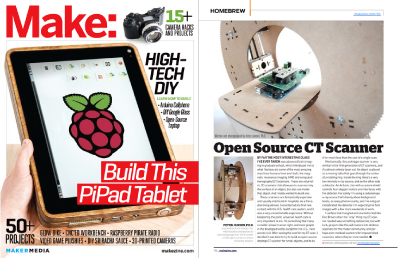 Very exciting news — the Open Source Desktop CT Scanner is featured in this month’s MAKE Magazine Homebrew Section. I’ve been a great fan of MAKE for years and presented the Science Tricorders at their first Hardware Innovation Workshop, and so it’s very exciting to see the project in this issue. Source Files: There’s been a lot of interest in having the source files for the alpha version of the scanner, and so I’ll endeavor to have these up within a week or so. I’m in the process of collecting and packaging the source, as well as moving everything to GitHub (including TODO lists) so that it’s much easier for folks to contribute. 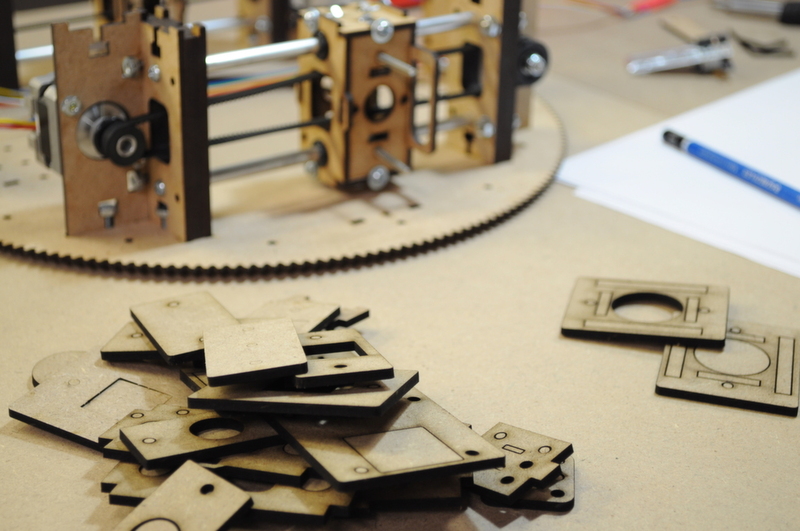 I think that the best thing for an open source project is to bootstrap an initial community of users that can grow into a community of contributors, and so I’d like to cut out a few sets of the laser cut parts to send to one or two folks who are interested in building (and ideally contributing) to the project. If you’re interested, please send along a note with your background and how you’d like to contribute, to peter at tricorderproject dot org. Some friends at the local hackerspace, Xerocraft, have organized what looks to be a great mini-maker faire style event here in Tucson this weekend called Maketopolis. I’ll be there with the open source CT scanner for any folks who want to drop by and see it in person. Hope to see you there! 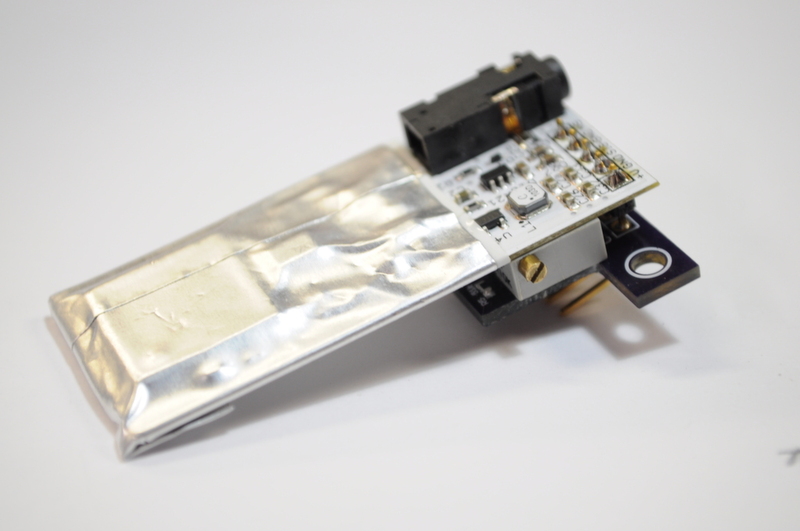 I thought I’d take a few moments to introduce the next prototype open source science tricorder that I’ve been working on, the Arduino-compatible Mark 5 Arducorder. I wasn’t having a great deal of luck with the earlier Mark 5 design, and so I decided to start from scratch and create something completely different under the hood. The new design has a larger sensor suite (a few sensors have been updated, and a multi-gas sensor had been added), but it should also be easier to program, easier for folks to tinker with, more modular, and less expensive to produce. It’s also Arduino Due compatible, so the hundred thousand folks out there who love Arduino programming and building simple circuits should feel right at home tinkering. 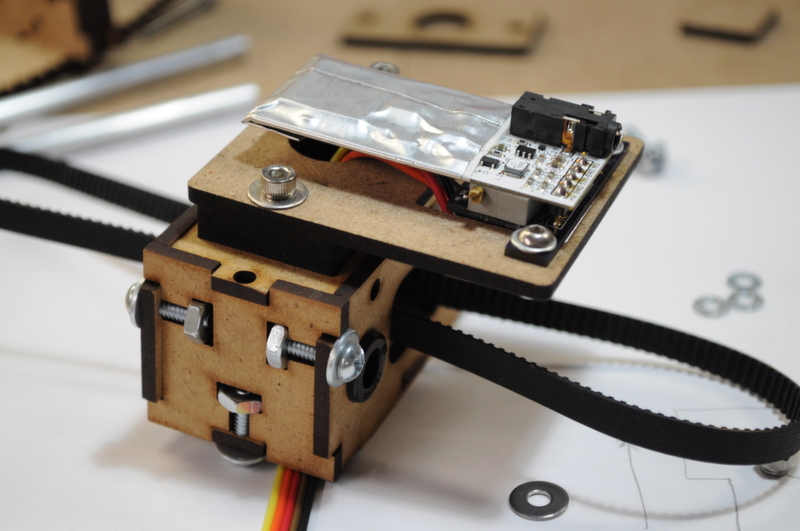 Like the Mark 1 and 2, the Mark 5 Arducorder has a separate motherboard and sensor board. 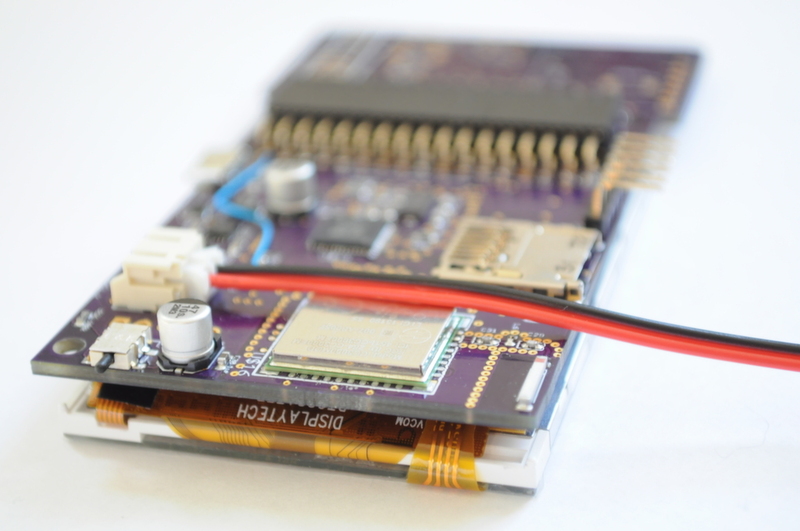 I think community building is a huge part of a successful open source design, and in this spirit I’d like it to be as easy as possible for folks to build new sensor boards for their Arducorders, or add expansions that I can’t anticipate. 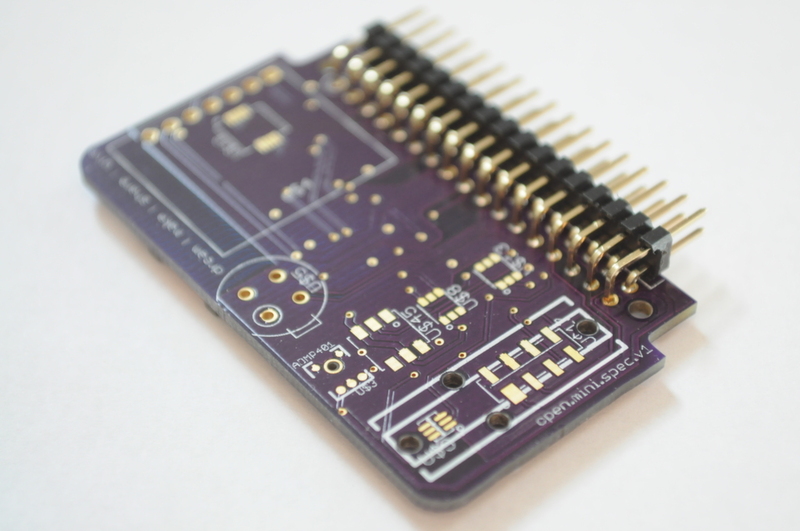 The Arduino folks have been very good with designing their boards to be expandable using “shields” that have standard, easy-to-prototype, 0.1″ headers. 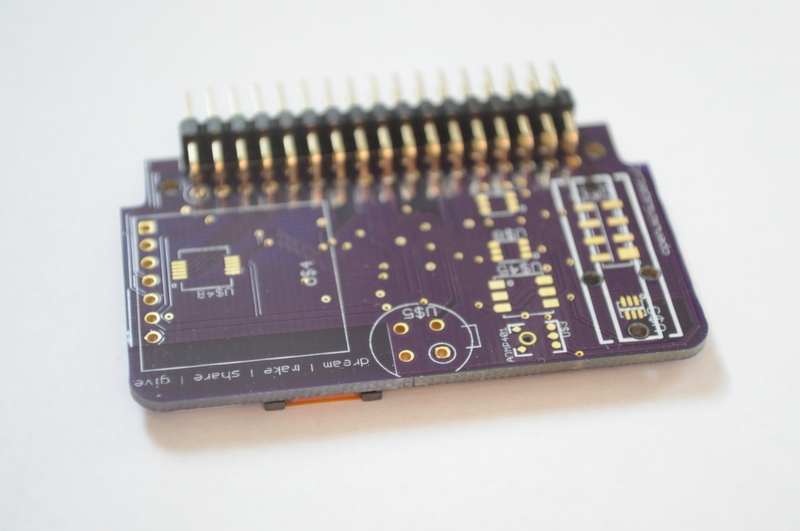 Similar to the idea of a shield, I’ve designed the Arducorder to have a 34-pin header for the sensor boards that expose a variety of pins for the I2C, UART, SPI, Analog, PWM, and Digital I/O peripherals, so that there are plenty of pins for expansion and interfacing to most kinds of sensors. These boards were an interesting challenge to design. 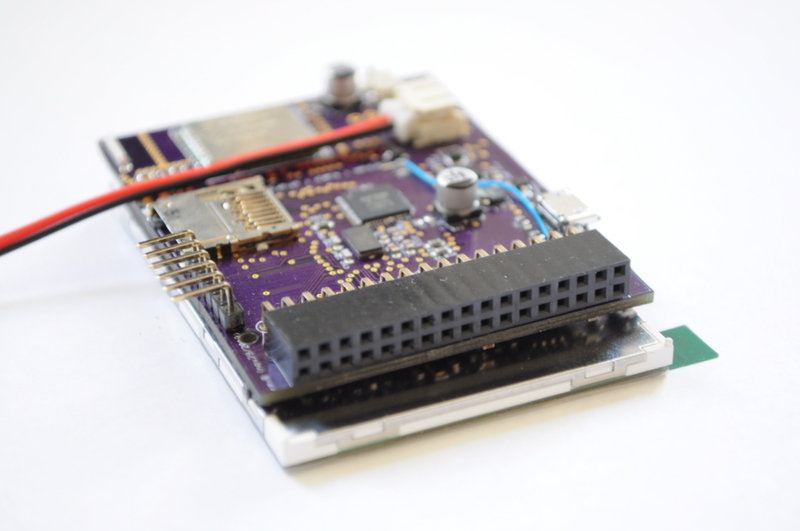 Conceptually the Arduino motherboards are fairly simple, but in order to maintain perfect compatibility with the Arduino Due board the routing was a little complex in areas. 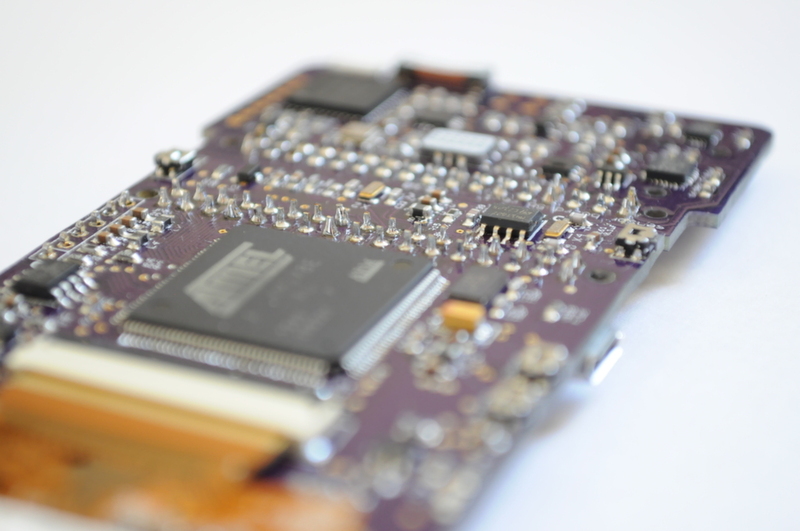 The whole Mark 5 Arducorder system is small — really small — and having the large easy-to-use sensor connector consumes a lot of real-estate, totaling nearly one quarter of the board area. Because of this I had to move to a 4-layer design, which takes a little longer to get fabbed. Still, the entire Arducorder including the 2.8″ LCD, WiFi module, and sensor board fits in about the same footprint as the original Arduino Due (or, about the size of my Blackberry), so it’s all quite compact and I’m very happy with the footprint. 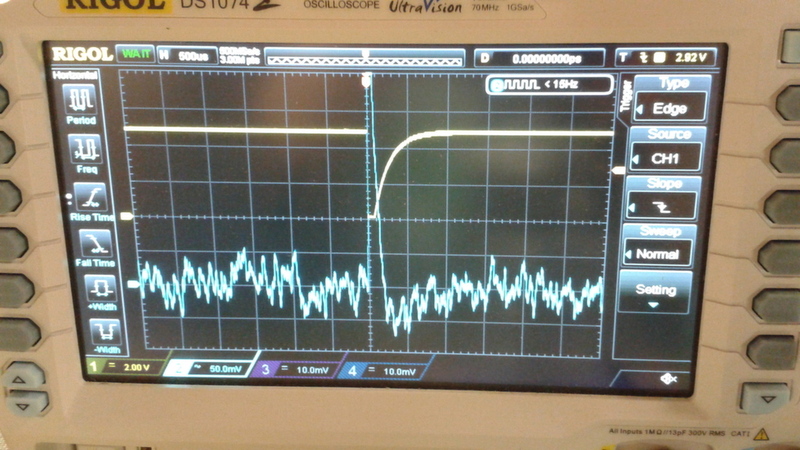 FT800 Graphics and Audio Controller to offload graphical rendering. Supports JPEG decompression. Having some mechanism to render quality graphics has been a requirement since the Mark 1 using its external SED1375 graphics controller, and was certainly the case with the Mark 2’s beautiful dual organic LED displays. 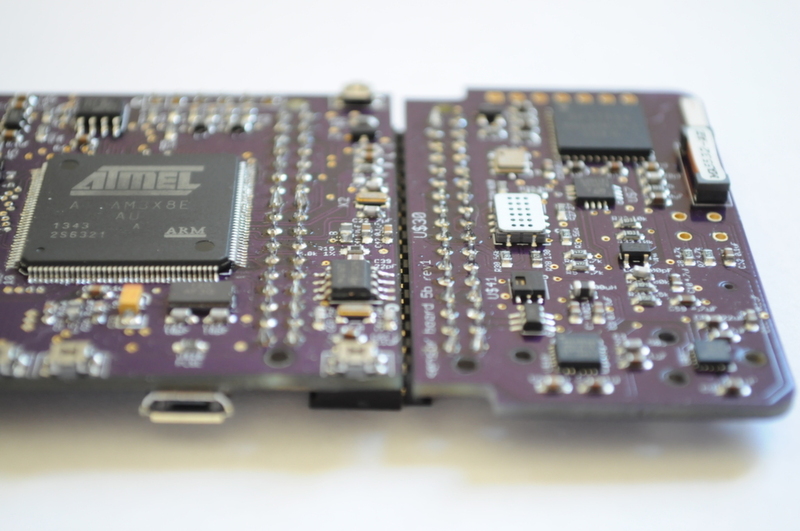 But graphics of any resolution have always been difficult for microcontroller-powered systems, like the PIC family (used in the Mark 1) or the Atmel microcontrollers used with the Arduino family of boards. Even with a microcontroller fast enough to perform graphics rendering, most microcontrollers don’t have nearly enough memory to support even a single framebuffer for a 320x240x16bpp screen (128k), so any graphics they do render tend to look choppy. 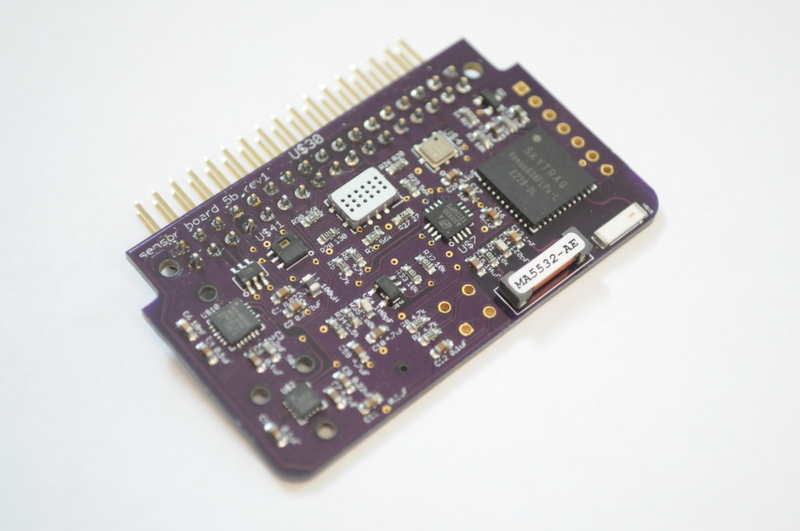 Enter the FT800 Graphics controller, a new product from FTDI, the same folks who make the popular FT232R USB-to-serial converter. 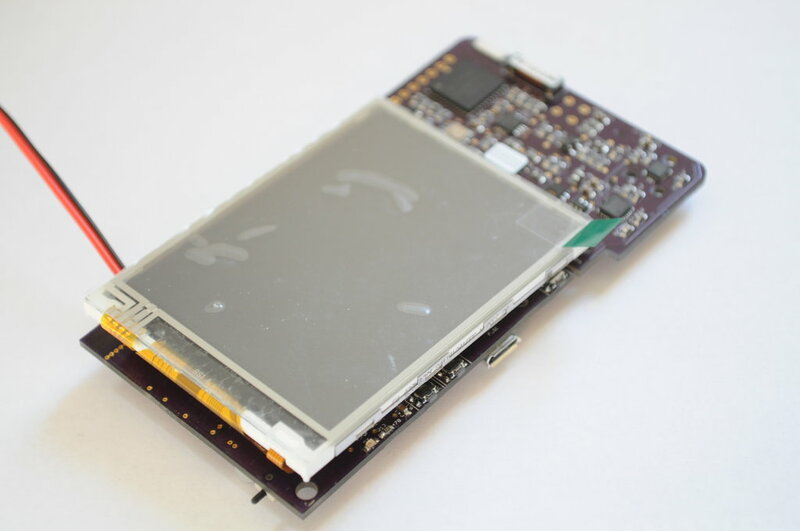 The FT800 looks a lot like a modern version of the the 2D tile-based graphics controllers found in handheld gaming systems a few years ago, while also incorporating audio and touch-screen peripherals. 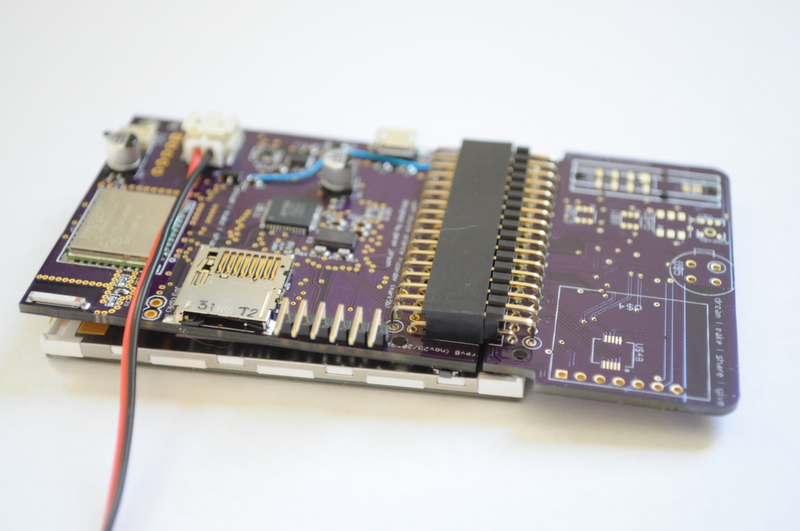 The Gameduino 2 is a recent Arduino-powered project that makes use of the FT800, and it shows Gameboy Advanced-era graphics on an Arduino Uno — so I’m confident that an attractive and elegant interface can be crafted on the Arducorder. While it has less graphical capabilities than the original Mark 5 design, it should be much easier for folks to modify — and I’m excited to see the first user interface themes folks come up with. 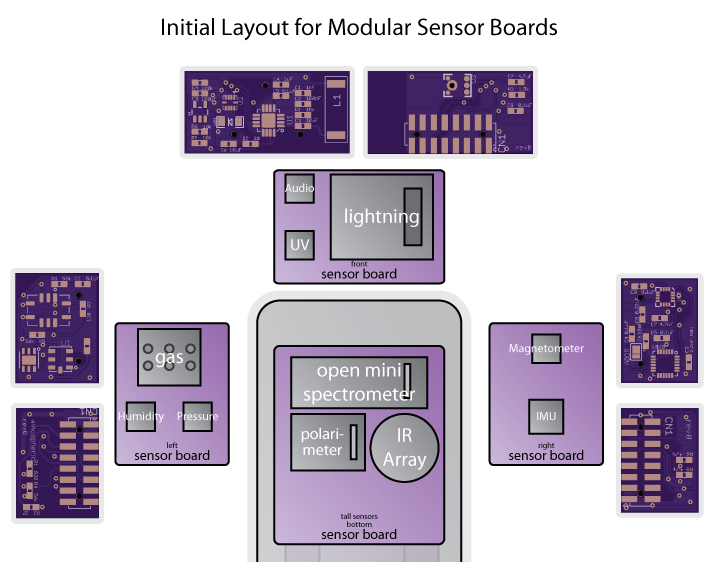 Many of these are new or updated offerings that either offer new sensing modalities that weren’t previously available (like the lightning sensor from AMS), or that improve upon resolution, size, or cost over previous versions. Gas sensing has been on the wishlist for a long while, but many contemporary sensors are large and use power-hungry heating elements — so I’m particularly excited about trying out new line of micro gas sensors from SGX. 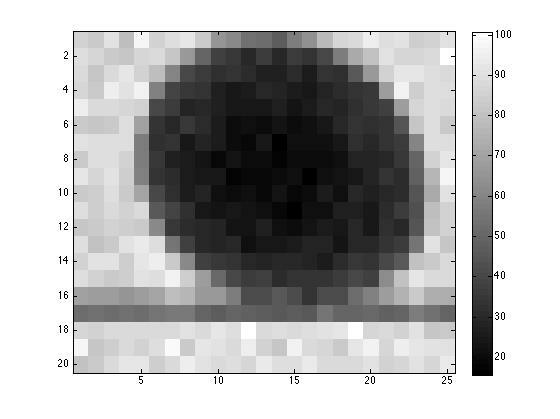 One sensor has been temporarily removed — the camera. There’s currently no easy way that I’m aware of to hook up a camera (which is a high bandwidth device) to an Arduino Due, which has limited memory. 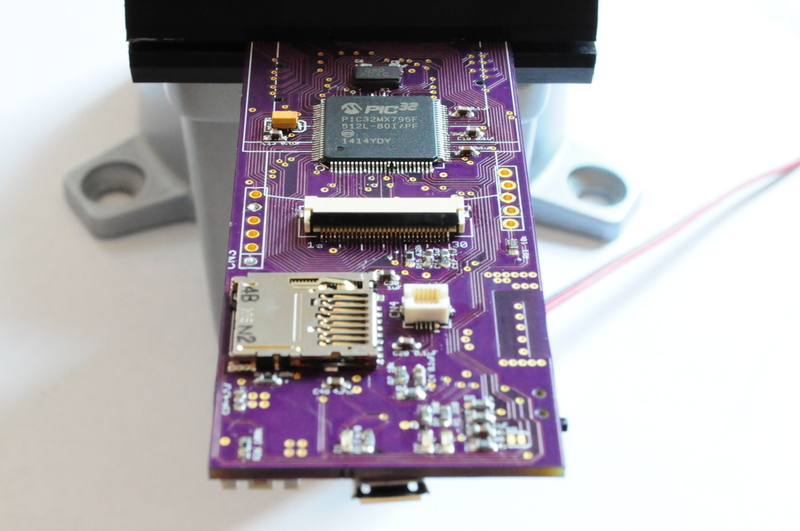 I’ve replaced the camera with a small board-to-board connector, in the hopes that someone in the open source community will develop a small SPI JPEG camera board with an onboard framebuffer shortly. If not, I’ll have to have a go at it once the rest of the device is functional. 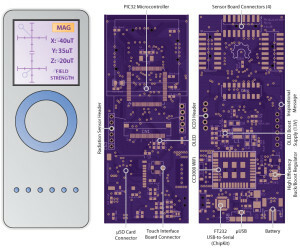 While the top of the sensor board contains the thin, omnidirectional sensors, the bottom contains many of the larger, directional sensors including the open mini spectrometer and the ultrasonic distance sensor. I’d love to find a shorter alternative to these sensors at some point, as right now they are the determining factor in the Mark 5’s thickness — about an inch. Currently I’m testing out the sensor board — some of the sensors are a bit expensive, so I’m iteratively populating the boards, testing, and so forth. I also have to 3D print more open mini spectrometers — my cats absolutely love to play with them, so the bunch I’ve made have vanished into the aether under the couch, never to be seen from again. 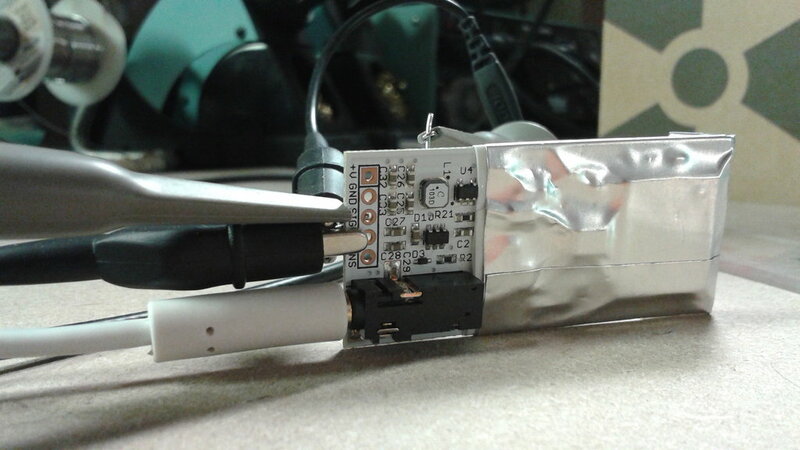 My current TODO list is to verify the basic functionality of the hardware (currently the FT800 as well as a few of the sensors have been tested), write low-level drivers for all the sensors and peripherals, then move on to creating the larger graphical user interface. 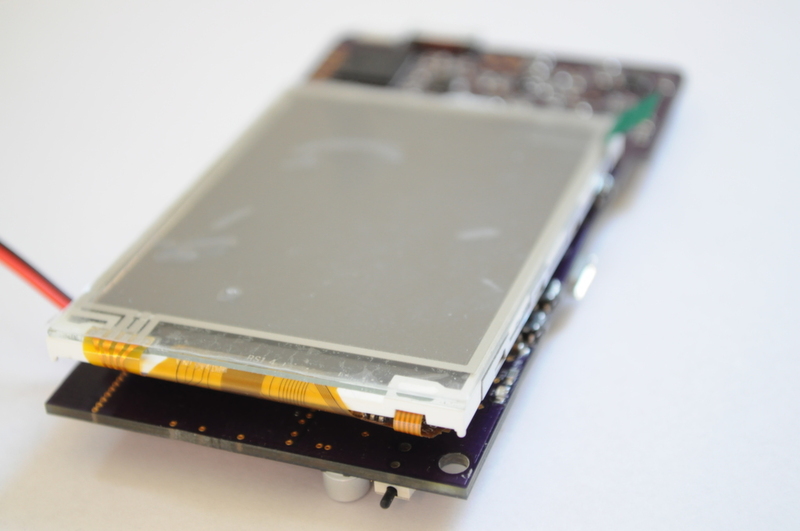 At first the graphical environment will likely be somewhat modest, but I’d love to recruit the help of some skilled folks from the open source community who would enjoy working on the interface side of things once the prototype hardware is stable. Please feel free to contact me if you’re interested. A bit of a story, and then a lot of pictures — by far the most interesting class I’ve ever taken was Advanced Brain Imaging in grad school. As a hands on lab class, each week we’d have a bit of a lecture on a new imaging technique, and then head off to the imaging lab where one of the grad students would often end up in the Magnetic Resonance Imager (MRI) and we’d see the technique we’d just learned about demonstrated. Before the class I was only aware of the structural images that most folks think of when they think of an MRI, as well as the functional MRI (or fMRI) scans that measure blood oxygenation levels correlated with brain activity and are often used in cognitive neuroscience experiments. But after learning about Diffusion Tensor Imaging, spin-labeling, and half a dozen other techniques, I decided that the MRI is probably one of the most amazing machines that humans have ever built. And I really wanted to build one. MRI is a spatial extension to nuclear magnetic resonance spectroscopy (NMR), and requires an extremely homogeneous high-intensity magnetic field to function — far more uniform than you can achieve with permanent magnets or electromagnets. For MRI, this uniformity is often accomplished using a superconducting magnet that’s cooled to near absolute zero using liquid helium. This, of course, makes it extremely technically difficult to make your own system. 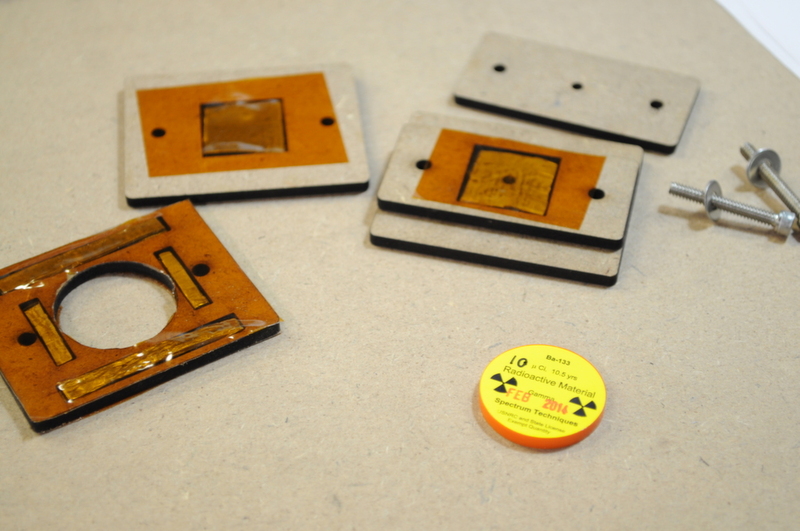 While folks have been able to use large electromagnets for NMR (they average out the magnetic field intensity over the sample by spinning the sample very rapidly while it’s inside the magnet), I haven’t seen anyone demonstrate building an imaging system using an electromagnet. 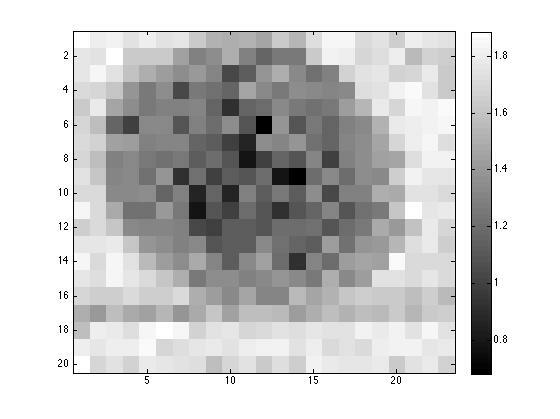 There are some experimental systems that try to use the Earth’s magnetic field, but the few systems I’m aware of are very low resolution, and very slow. Volumetric biological imaging has two commonly used tools — MRI and Computed Tomography (or CT), sometimes also called Computed Axial Tomography (or “CAT”) scanning — although ultrasound, EEG, and a bunch of other techniques are also available. Fast forward about two years from my brain imaging class (to about three years ago), I had started my first postdoc and happened to be sitting in on a computational sensing / compressed sensing course. About the same time I happened to be a little under the weather, and stopped into a clinic. I thought I’d torn a muscle rock climbing, but after examining me the doctor at the clinic thought that I might have a serious stomach issue, and urged me to visit an emergency room right away. As a Canadian living abroad, this was my first real contact with the US health care system, and as exciting as getting a CT was (from the perspective of being a scientist interested in medical imaging), from a social perspective it was a very uncomfortable experience. Without really going into details or belaboring the point, universal health care is very important to me, and (what many consider) a basic human right that most of the folks in the developed world have access to. My mom was diagnosed with cancer when I was young, and we spent an awful lot of time in hospitals. Her and my dad still do, after 15 years and more surgeries than anyone can count. It’s frightening to think of where we’d all be if her medical care wasn’t free. And so when a bill showed up a month or so after my emergency room visit for nearly $5,000 (most of which was covered by a health insurance company), I nearly needed a second trip to the emergency room, and I thought a lot about the many folks I knew, including my girlfriend at the time, who didn’t have any form of health insurance and basically couldn’t go to the doctor when they were ill for fear of massive financial damage. With all of this in mind, knowing the basics of medical imaging, and having just discussed computed tomography and the Radon transform in the class I was sitting in on, I decided that I wanted to try and build an open source CT scanner, and to do it for a lot less than the cost of me getting scanned, by using rapid prototyping methods like laser cutting and 3D printing. It’s been a few years since I’ve had access to a laser cutter, and they’re one of my favorite and most productive rapid prototyping tools. 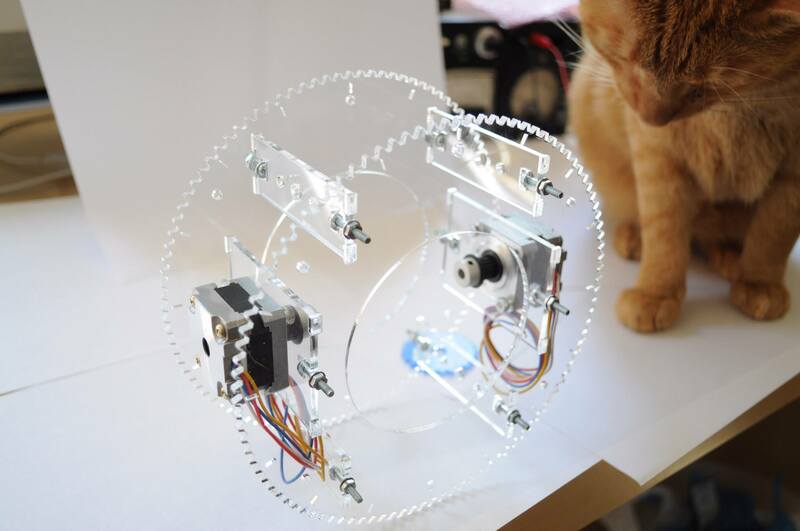 In the spirit of efforts like the Reprap project, I enjoy exploring non-traditional approaches to design, and designing machines that can be almost entirely 3D printed or laser cut. Fast-forward almost two and a half years to last month, and the local hackerspace happened to have a beautiful laser cutter generously donated. This is the first cutter I’ve had real access to since grad school, and with the CT scanner project waiting for a laser cutter and a rainy day for nearly two years, I immediately knew what I wanted to have a go at designing. On to the details. From a high-level technical standpoint, a computed tomography or CT scanner takes a bunch of absorption images of an object (for example, x-ray images) from a variety of different angles, and then backs out 3D volumetric data from this collection of 2D images taken from different angles. 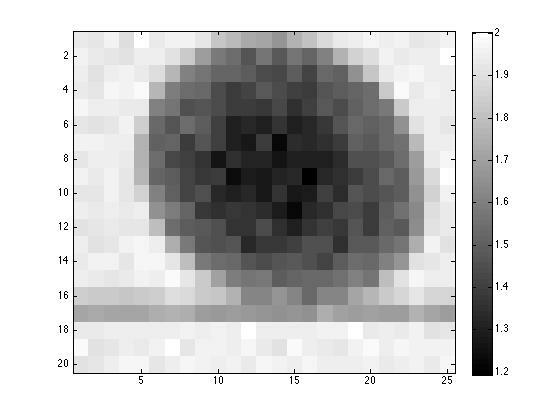 In practice, this is usually done one 2D “slice” at a time, first by rotating an x-ray scanner around an object, taking a bunch of 1D images at tens or hundreds of angles, and then using the Radon transform to compute a given 2D slice from this collection of 1D images. 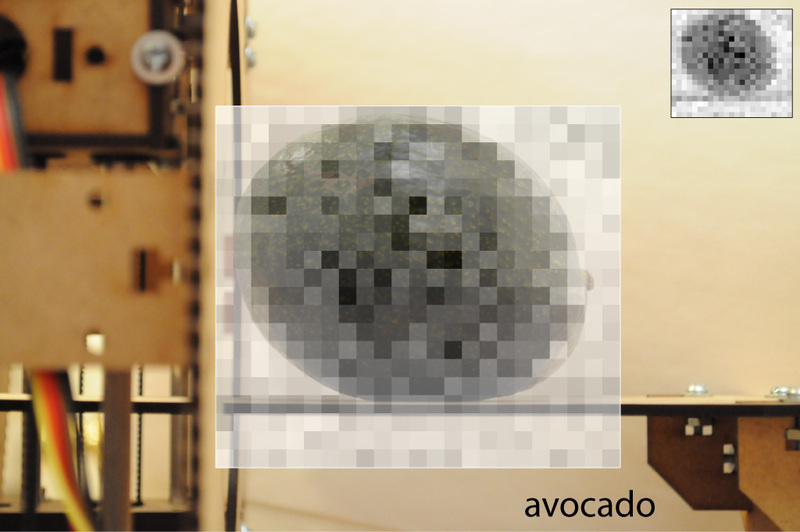 One can then inspect the 2D slices directly to see what’s inside something, or stack the slices to view the object in 3D. Mechanically, this prototype scanner is very similar to the first generation of CT scanners. 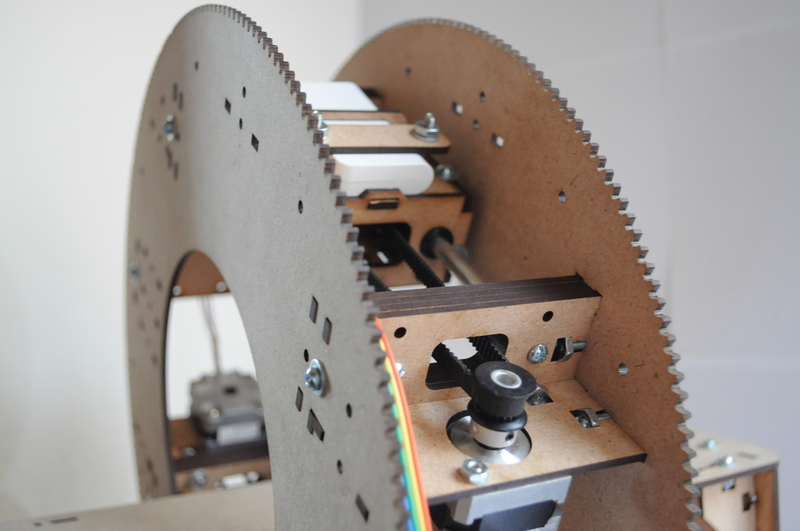 An object is placed on a moving table that goes through the center of a rotating ring (or “gantry”). Inside the ring there’s an x-ray source, and on the other side a detector, both mounted on linear stages that can move up and down in unison. 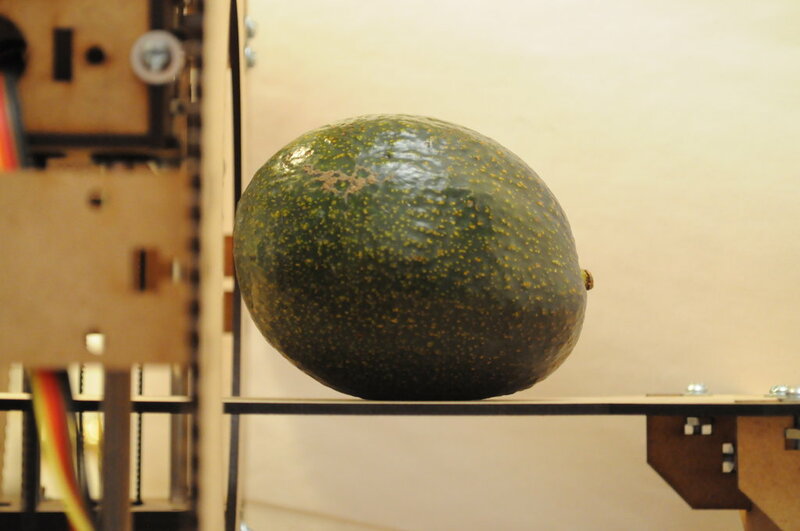 To scan an object, the table moves the object to the slice of interest, the gantry rotates to a given angle, then scans the source and detector across the object to produce a 1D x-ray image. The gantry then rotates to another angle, and the process repeats, generating another 1D image from a slightly different angle. 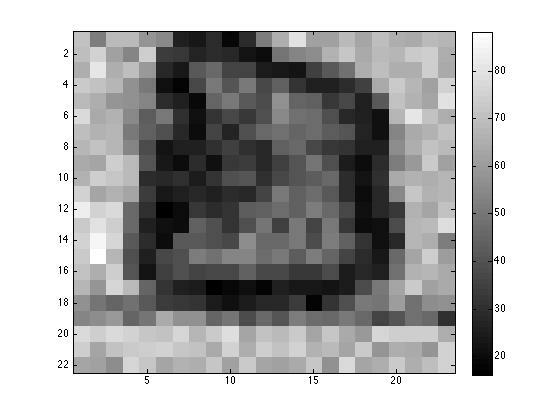 After generating tens or hundreds of these 1D slices from different angles, one backs out the 2D image of that slice using the Radon transform. 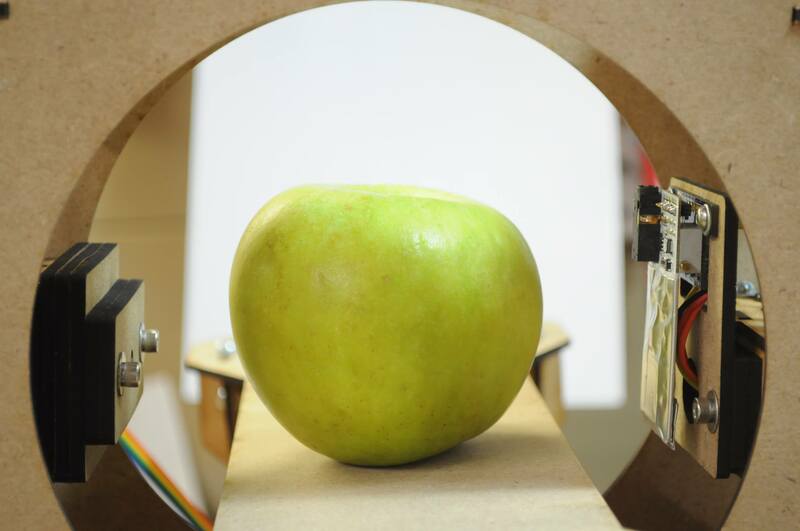 The table then moves the object slightly, and the process is repeated for the next slice, and the hundreds of other slices that are often taken in a medical scan. Modern scanners parallelize this task by using a fan-shaped beam of x-rays and hundreds of simultaneous detectors to scan someone in about a minute, but the first generation of scanners could take several minutes per slice, meaning a scan with even tens of slices could take an hour or more. 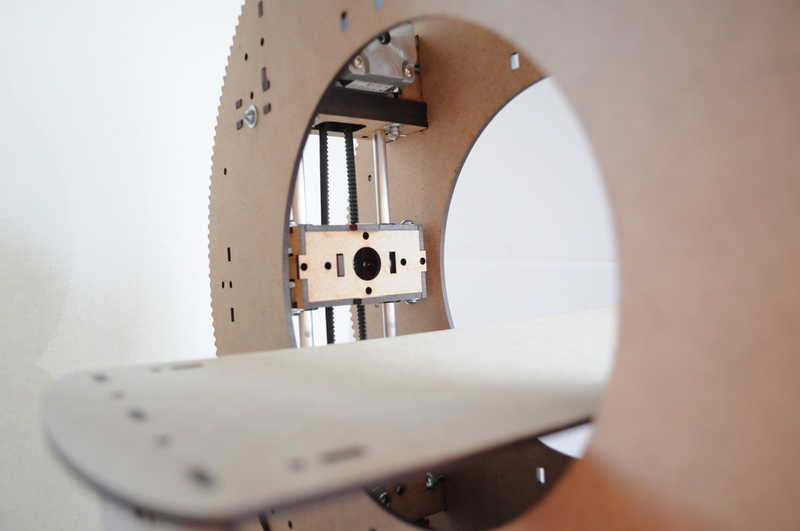 Designing an almost entirely laser-cuttable CT scanner with four axes of motion, one being a large rotary gantry, was a lot of fun and an interesting design challenge. 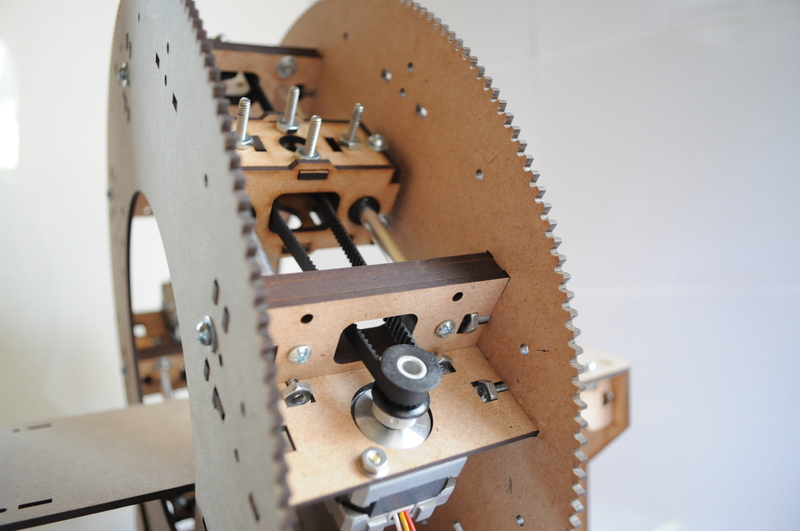 I decided that a good way to rotate the gantry would be to design it as a giant cog that sat atop a system of drive and idler cogs, that could slowly index it to any angle. 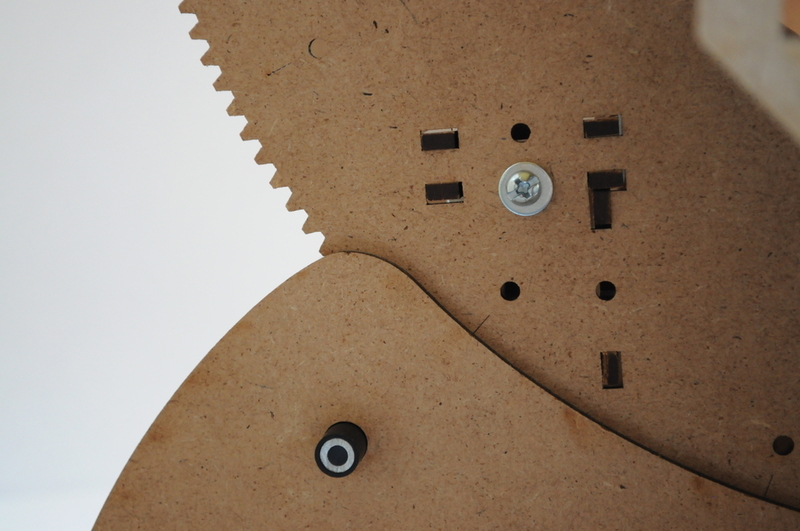 One of the issues with laser cutting a giant cog is finding something to mate with it that can transfer motion. 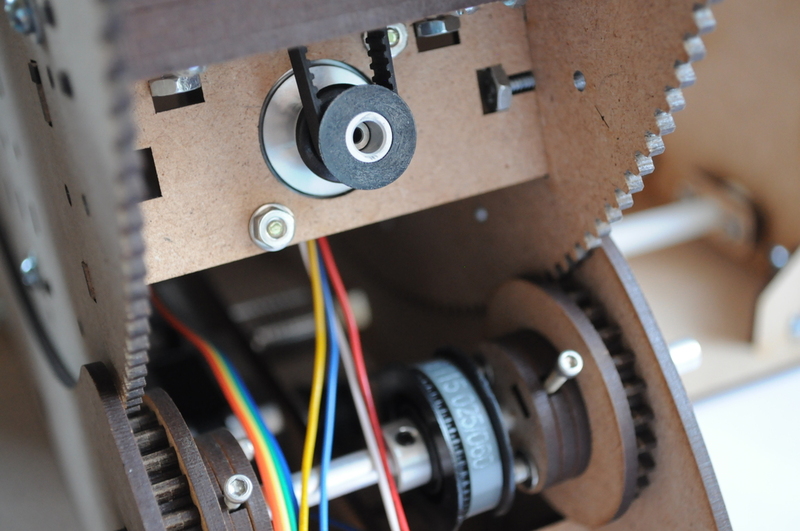 I’ve press-fit laser cut gears onto motor shafts before (like with the laser cut linear CNC axis, but in my experience they can slip or wear rather quickly, and I like being able to disassemble and reassemble things with ease. 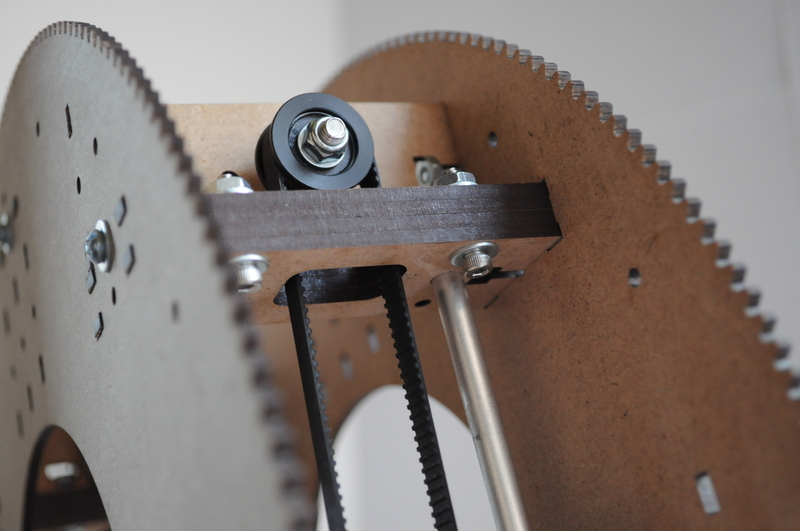 I decided to try something new, and designed a laser-cuttable 2.5D timing pulley that mates with the main rotary cog, and securely mounts on a rotary shaft using a captive nut and set screw. 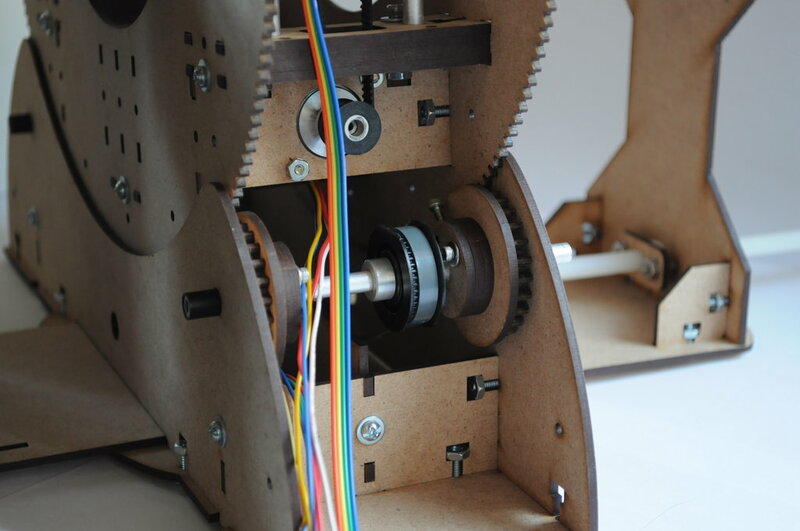 On either side of the shaft there’s space for a bushing that connects to the base, and inside the base there’s a NEMA17 stepper from Adafruit that transfers motion to the drive shaft using a belt and timing pulleys. 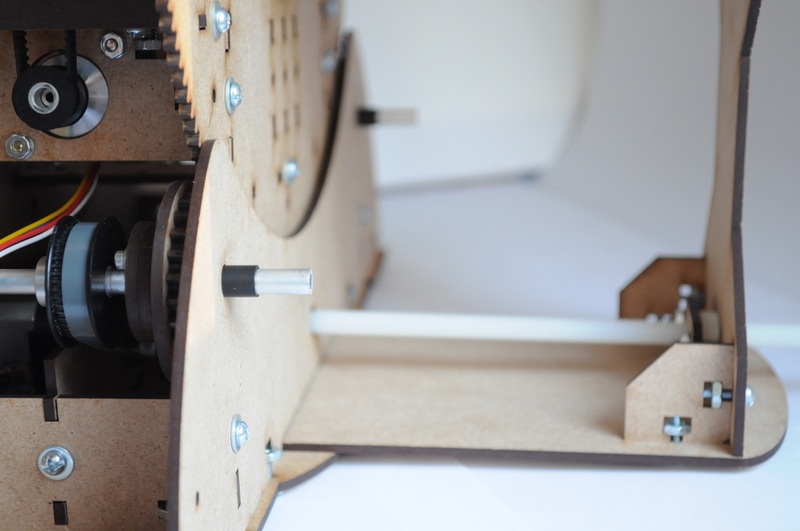 A small lip on the base acts as the other edge of the timing pulley, and helps keep the main rotary axis aligned. Inside the rotary gantry are two linear axes 180 degrees apart — one for the source and the other for the detector. The gantry is about 32cm in diameter, with the bore about 15cm, and the gantry itself is about 8cm thick to contain the linear axes. Each linear axis has a small carriage that contains mounts for either the source or detector, some snap bushings for two aluminum rails, and a compression mount for the timing belt. 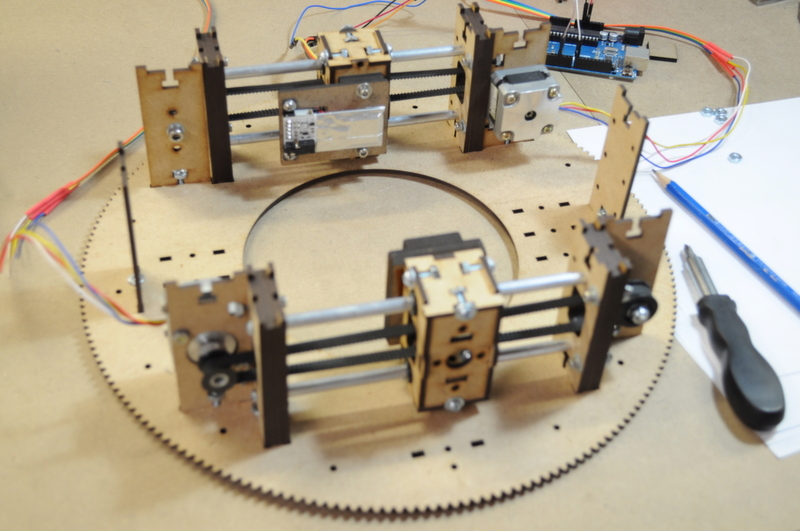 Each axis also has an inexpensive NEMA14 stepper and an idler pulley. 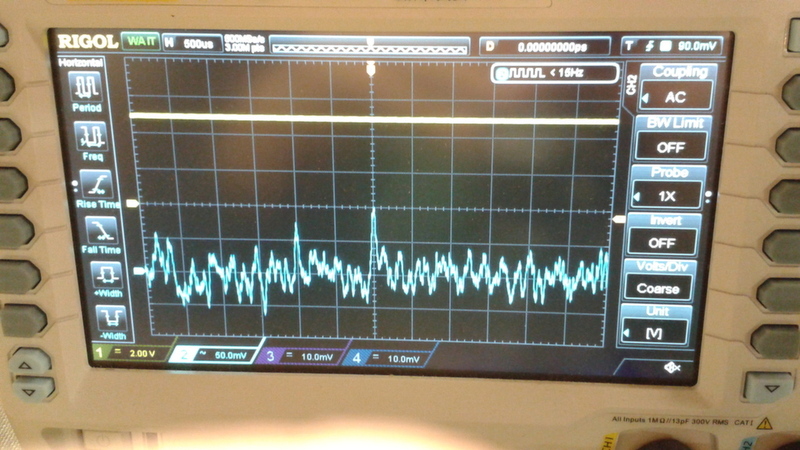 Here, I’m using a very small solid state high-energy particle detector called the Type-5 from Radiation Watch, which can be easily connected to an external microcontroller. 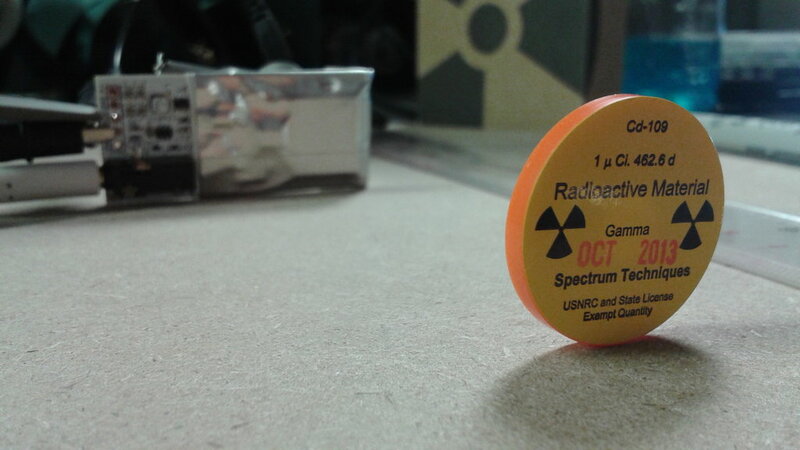 This is really very easy to work with, and saves me from having to use a photomultiplier tube and scintillation crystal that I found on eBay from an old decommissioned PET/CT scanner. I’m certain if the symmetry were any more perfect, it would move one to tears. 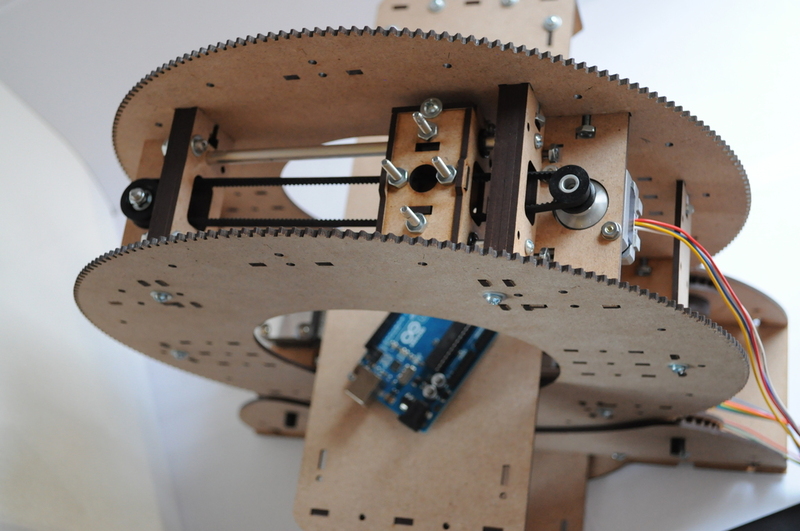 The rotary gantry has to be symmetric to ensure proper balance and smooth rotation. 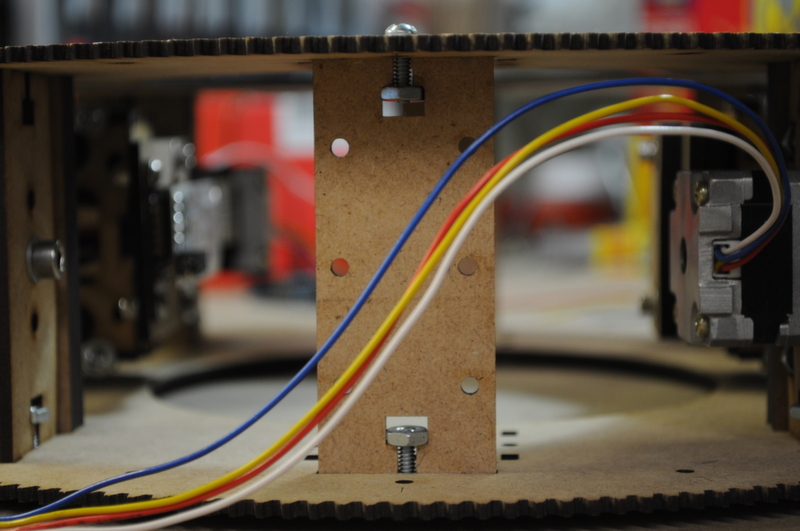 After rotating the gantry 180 degrees, here you can see the other linear axis intended for the source. 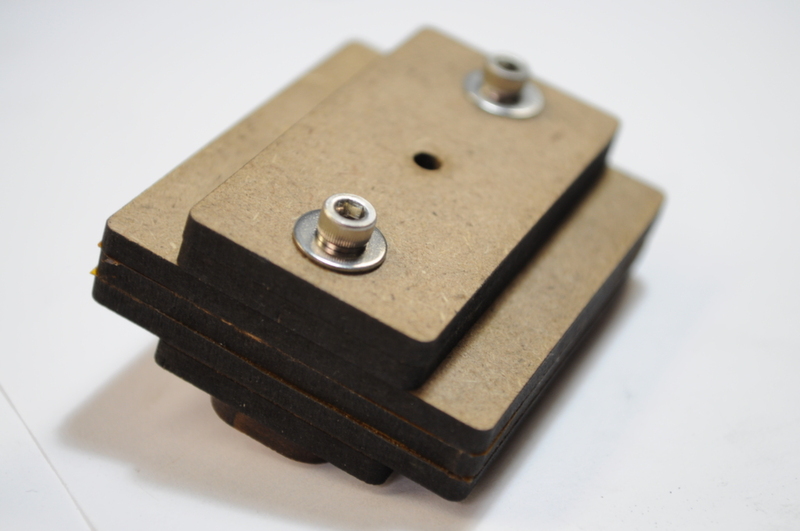 It currently just contains a mount pattern with 4 bolts, that a source will eventually mount to. Safety is very important to me. In medical diagnostic imaging it’s often important to have an image as soon as possible, but that’s not the case for scanning non-living objects purely for scientific or educational interest. This chart from XKCD shows the radiation that folks typically absorb from every day adventures like banana-eating and sleeping beside someone to hopping on planes or having a diagnostic x-ray. 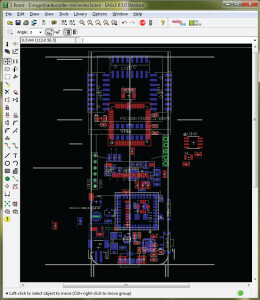 I’ve designed this scanner to operate on levels slightly above the natural background level, well into the blue (least intense) section of the xkcd graph, and make use of a “check source”, which is an extremely low intensity source used to verify the functionality of a high-energy particle detector. The trade-off for this safety is acquisition time, and it will likely take a day or more to acquire data for even a small object. This aspect of the design is scalable, such that if the scanner were to be used in a research environment in a shielded room, folks braver than I should be able to acquire an image a good deal faster. The sandwich of four plates on either end of the linear axes contain precision mounts for the aluminum shafts, as well as a setscrew with captive nut to hold the shafts in place. The table itself is about 40cm long, and offers nearly 30cm of travel. It uses a light-weight nylon lead screw to index the table, with a NEMA14 drive motor located in the base. 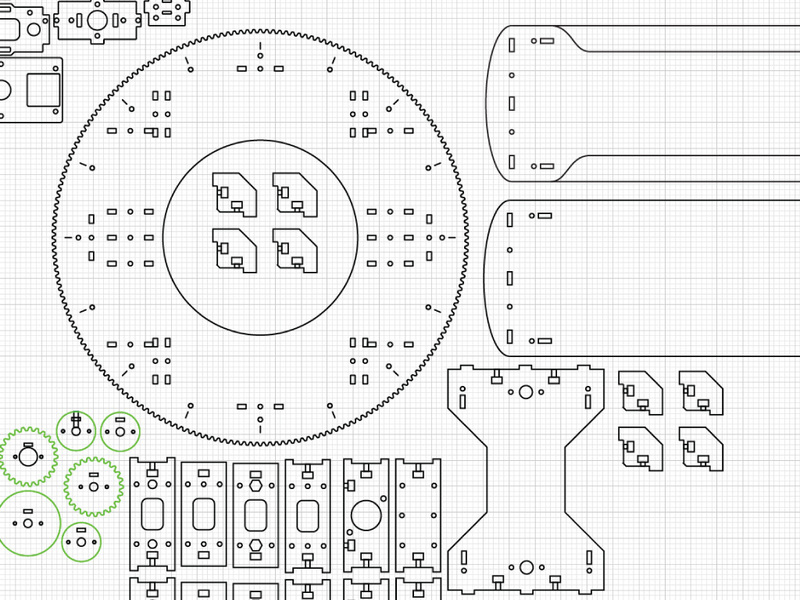 When I solidify all the bits that have to be in the controller, I’ll endeavor to lay out a proper board much like this prototype, but with four stepper controllers, and an SD card slot to store the image data for long scans. 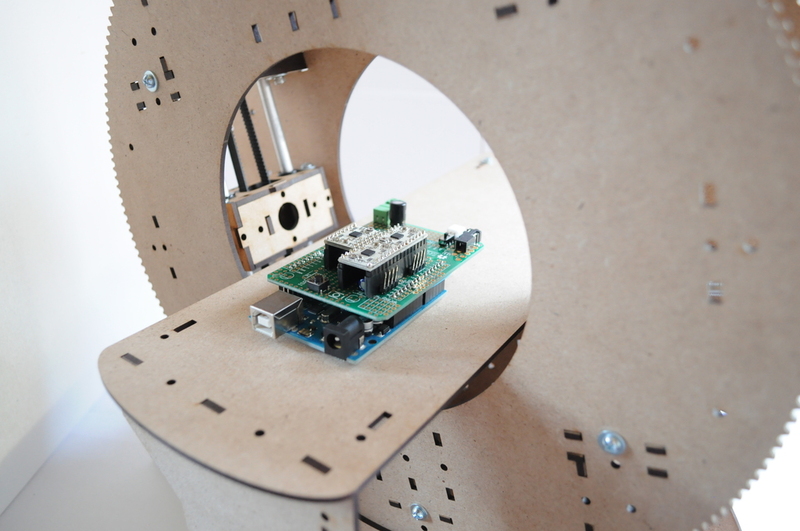 For size, here you can see the Arduino and shield together on the scanning table. 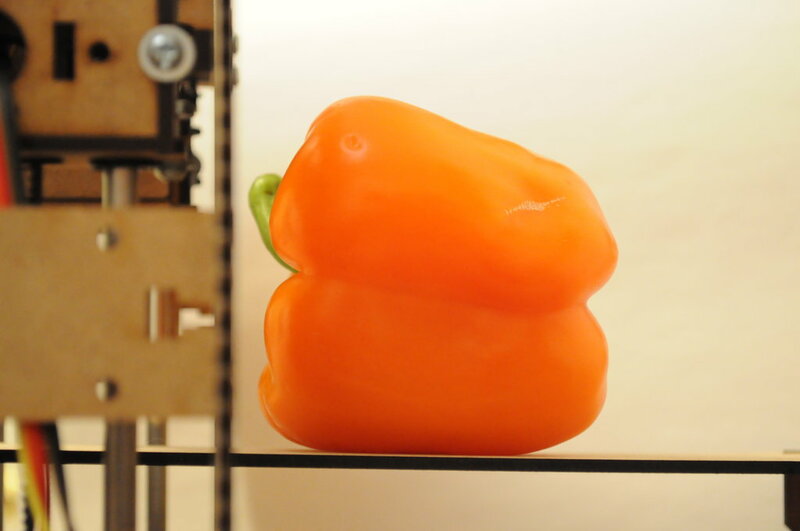 I’m hoping to start by scanning a carrot, move up to a bell pepper (which has more non-symmetric structure), and work up to an Apple. Since time on commercial machines is very expensive, I think one of the niche applications for a tiny desktop CT scanner might be in time-lapse scans for slowly moving systems. If the resolution and scan speed end up being up to the task, I think it’d be beautiful to plant a fast-sprouting seed in a tiny pot and continually scan it over a week or two to build a 3D volumetric movie of the plant growing, from watching the roots in the pot grow, to the stalk shooting up and unfurling its first leaves. I’m sure the cost of generating that kind of data on a medical system would be astronomical, where the material cost of this prototype is in the ballpark of about $200, although I’m expecting that a source will add about $100 to that figure. 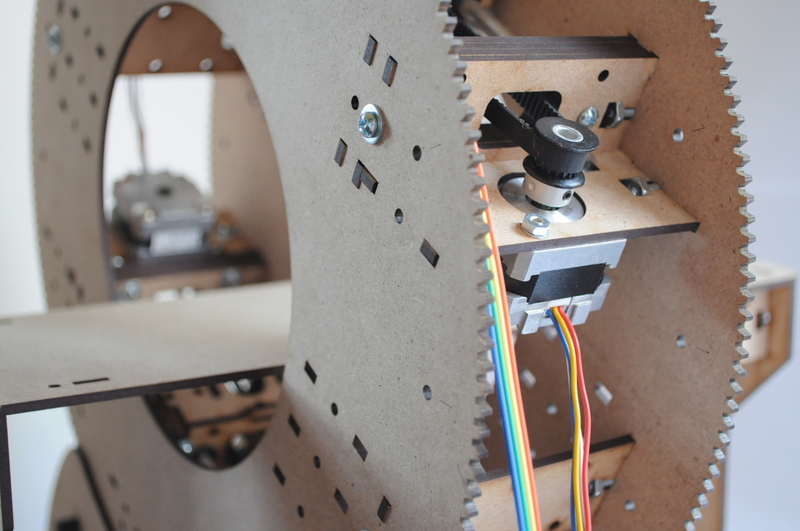 Laser cutters are really amazing machines, and it’s really incredible to be able to dream up a machine one morning, spend an afternoon designing it, and have a moving functional prototype cut out and assembled later that evening that you can rapidly iterate from. Since laser cutters are still very expensive, this work wouldn’t have been possible without kind folks making very generous donations to my local hackerspace, and I’m extremely thankful for their community-minded spirit of giving.